While in Jacksonville, I want to take the opportunity to explore surrounding cities that wouldn't have been on my radar otherwise. I didnt really know much about Chattanooga when I decided I wanted to visit. It was the bridges that lured me in and after visiting this past weekend, it was totally worth it. We started our trip on a saturday morning with the goal of arriving by lunch. It was almost a six and half hour ride for us. A few weeks ago, I found us a beautiful house to rent for the weekend on vrbo.com. The house was conveniently located in the North Shore district and was walking distance from Coolidge Park and Walnut Street Bridge. One of the first things you notice about Chattanooga is the beauty in and around it. The River City is surrounded by mountains and ridges that make for a constantly beautiful backdrop. In the city itself, there is public art everywhere. In 2001, efforts to improve downtown included a waterfront plan that beautified the city and the riverfront. As a result, sculptures and art installations are everywhere. You also notice a specific shade of blue all around you- on the bridges, the rails, river front paths and their rhino (named Blue Boy). Native Americans were the first inhabitants of Chattanooga and in 1838 they were forced to move to Oklahoma by the US government. This exodus was called the Trail of Tears. I remembered hearing about this in elementary school but had no idea where it started. While walking around in Renaissance park, I noticed a really sad but beautiful sculpture. The sculpture reintroduced me to the Trail of Tears. In Chattanooga, Native Americans were kept in internment camps at Ross's landing before they were pushed out. There is a memorial there today but it really doesn't portray the severity of what took place over a 150 years ago. We did drive to one destination- Rock City. Lookout Mountain kept coming up as a must see on all blogs, websites about Chattanooga. While driving there, we came to realize it is actually in Georgia. 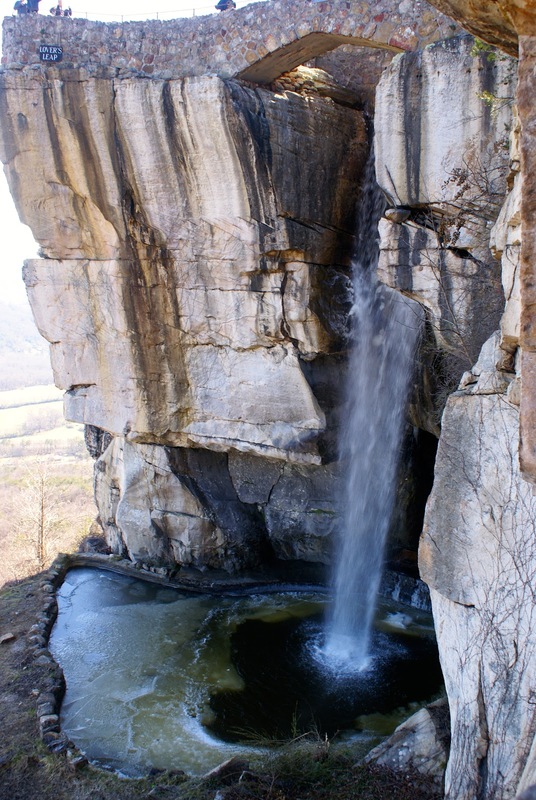 20 minutes from Chattanooga, it is a beautiful area that allows you to see 7 states from the lookout point. Most critics claim you can only see 5 states. As we entered, we realized the attraction is setup very much like an amusement park and has a It's a Small World type feel to it because of all the gnomes! They caught us by surprise and were everywhere. In the end, the views were worth the ticket price but just be warned. If you are hoping to hike like we were, Point Park might be a better choice. The last stop on our trip was the Hunter Museum of American Art. This visit was one of my favorite museum experiences ever. The museum has an old mansion and a modern extension that are connected. There are a lot of pieces outside that really do entice you to come inside. Our favorite was Boreal, a horse made out of welded metal. Another favorite was The Glass Art of Paul Stankard. The Hunter utilized the guide by cell audio tour which made the entire experience so much for fun and laid back. All in all, Chattanooga was a great weekend destination. It had great food, lots of local restaurants and boutiques and great people. It also has a great aquarium that we decided to skip because we wanted to be outside. But maybe next time!